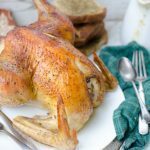 After a shortage of chicken on the homestead for the last year, I’m being extra careful to be sure that our freezer-full will last all the way until summer. One way that I’m trying to manage that is by stretching the chickens I prepare so they will feed us for two or three days depending on the size of the bird. 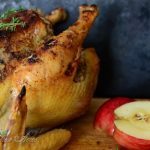 The one chicken that I allot for the week is first grilled or roasted depending on the weather then half is eaten and the remaining half is divided into 2 cup sized portions and prepared another night during the week. Biscuit-Topped Chicken Pot Pie helps make that happen! 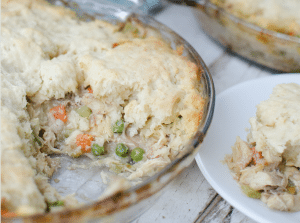 One of our favorite meals to use stretched chicken with is traditional chicken pot pie. It’s a hearty meal and one that I associate with dark, brisk, winter evenings. 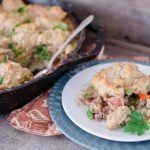 And Biscuit-Topped Chicken Pot Pie is equally as comforting without all of the pie crust rolling. 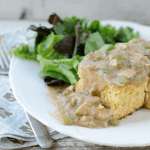 The gravy is full of flavor, the biscuit is light and fluffy, and the tender-crisp vegetables are versatile, working well with whatever you have on hand. I’ve omitted both the onion and celery and it’s still just as good. In a skillet, melt the butter and saute the diced onion, celery, and carrot over medium heat until tender. 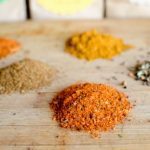 Season with salt and pepper and divide among two pie dishes or a 9 X 13 baking pan. Stir in the frozen peas and cooked chicken (dividing among the two dishes if necessary). To prepare the gravy, melt the 1/4 c. butter in a saucepan over low heat. Season with salt and pepper and whisk in the 1/4 c. flour and continue to whisk for a couple of minutes. Add in the stock and milk and bring to a simmer. Continue to simmer the gravy until it begins to thicken up a little. Divide the gravy among the chicken mixture dishes and stir in. For the biscuit topping, whisk together the flour, salt, and baking powder. Cut in the 6 T. butter until the mixture is coarse and crumbly. Stir in the milk, beginning with a cup and adding the additional 1/2 as necessary to bring the biscuit together. Dividing among the dishes, spoon the dough, if wet, on top of the chicken mixture and spread with the back of a spoon to cover the entire surface. Or, if the dough is dry enough, pat flat to the size of the pan and place on top of the mixture. If desired, brush the top with melted butter and bake the pie for 30 minutes.